Sold by LikePop and Fulfilled by Amazon. Gift-wrap available. 【Multi-function】 Ideal for use on a variety of surfaces. It is an awesome tool. 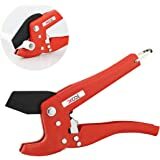 The punch plier is commonly used for punching round holes in leather, belts, plastic, rubber, canvas, fabric, cardboard, saddles, and similar materials; especially useful as a leather hole punch. It has 6 different sizes, which is perfect for home hobby or commercial use. Hole size dimensions: 2mm, 2.5mm, 3mm, 3.5mm, 4mm and 4.5mm. And the six tapers are very sharp to meet the maximum demand. 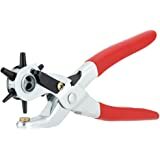 【High Quality and Safety】 The durable punch plier is made of plated steel that is high hardness, good toughness and durable. The surface of metal deal with spray lacquer process to avoid oxidation. The brass pad adopts the thickness design to guarantee on safety. And in our kits, we add grinding rod on it for easy cleaning. 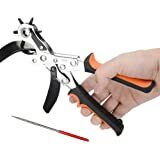 【Ergonomics Design】 The professional punch plier adopts double lever mechanism to greatly save your strength. 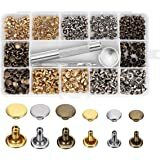 Powerful and do not require much strength to get perfect holes. Powerful penetrability makes the work easier. 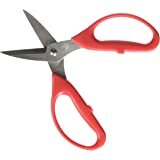 And the punch plier has an anti-slid and environmental protection handle. The non-slip handle provides greater comfort, which guarantee on long-lasting working. 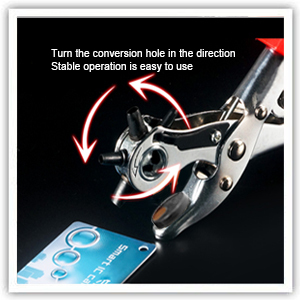 【Convenient Storage】 In the bottom of punch plier, there is a stainless buckle. When you don’t work, you can buckle the safe lock. And the punch plier will become small to save your space. 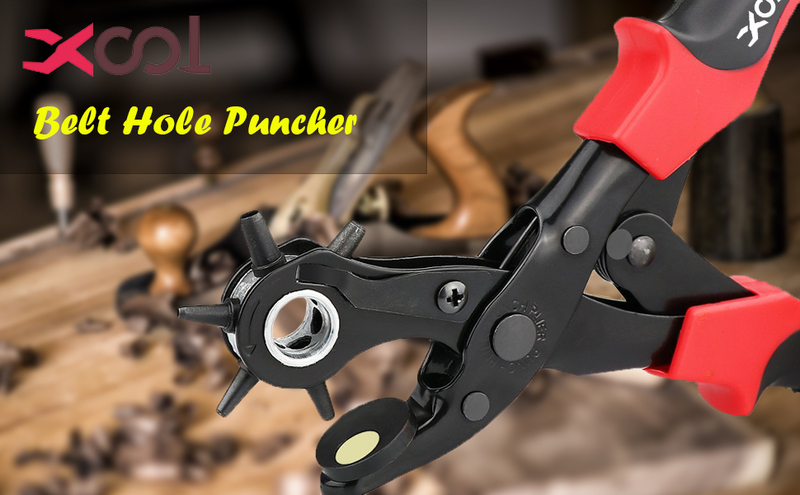 【Excellent Product Performance】 The unique design of punch plier allows for use with one hand and gives you the ability to create stronger punches; especially useful as a leather hole punch. Convenient spring tension gives superior power and comfort, fits your palm and allows for maximum force output. Comfortable design for easy punching and less hand fatigue. 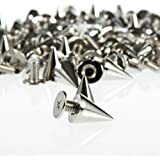 Sold by LikePop and ships from Amazon Fulfillment. Sold by Simmper and ships from Amazon Fulfillment. XOOL Punch Plier is an awesome tool. It adopt high quality plated steel for extra sharp cutting, has double lever mechanism and is professional quality so it will last longer than some other brands on the market. 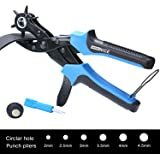 The punch plier is commonly used for punching round holes in leather, belts, plastic, rubber, canvas, fabric, cardboard, saddles, and similar materials; especially useful as a leather hole punch. 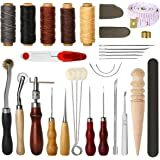 Designed for punching neat holes in belts, bags, horse tack & saddles, shoes, sandals, pet collars, id & store cards and for many different craft projects. We think you will love it very much! When you rotate the wheel difficultly, please loose the screw as the picture shown. The convenient handle clasp makes our XOOL leather hole puncher easy-to-store in any tool bag or drawer when not in use. The sturdy rotary hole sizes also lock into place for safety. Double lever mechanism to greatly save your strength. 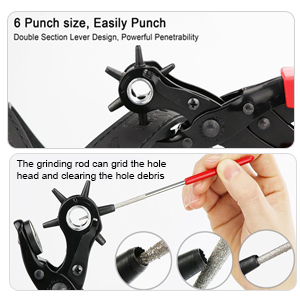 Powerful and do not require much strength to get perfect holes. Comfortable and anti-slip Grip-Handle can improve your work efficiency. wheel anti-clockwise to the desired size. Convenient spring tension gives superior power and comfort, fits your palm and allows for maximum force output. Heavy duty construction. Seems well built. Used it to put new holes in a rubber watch band. Worked very well. Giving it 4 stars only because each punch die is not labeled. 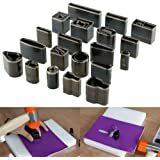 You can figure out the size of each punch die being that you know the range of sizes that this punch comes with. It would just have been nice if they were indiviually marked. Punch also comes with a screw driver, an extra base plate as well as a cyclindrical rasp file to clean out and re-hone/sharpen each die. *TIP#1: Put a thick piece of cardboard or 5 sheets of paper on the bottom of what you are looking to punch through. 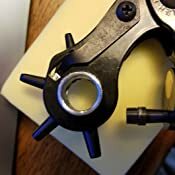 This allows the punch to go completely through your item for a clean sharp punch and also helps to keep down the wear and tear on the punch strike plate. *TIP#2: Work from the good side down. Punch your hole through the finish side down. This should help avoid any messy end cuts. So far so good. I would definitely purchase this item again. Now that we are well into our second month of the Biggest Loser (BL) you may be realizing an unforeseen consequence of participating in the BL. Like me you may now be suffering from sagging pants. This is an unfortunate effect of losing inches from the waist so fast that the notches in the belt can’t keep up. In my case I ran out of notches. The message is clear, sagging pants are not acceptable. So, what to do? New belts are expensive and if you are losing inches like me, you would need to buy a new belt every week. 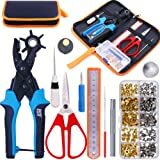 There is hope and it is the XOOL Revolving Punch Plier Kit. 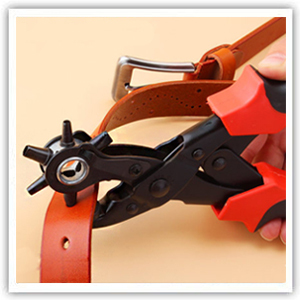 With this simple but effective tool you can add belt notches as fast as you need them. In just minutes, I have added notches to each of my belts. No more sagging pants. Now my pants stay up, I look professional, and I’m HR policy compliant. For the price of this tool I was pleasantly surprised. 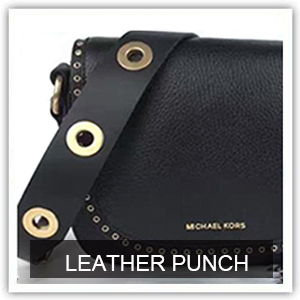 It's well made and punches even thick leather with ease. 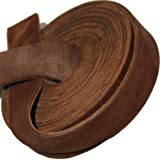 I had two thick expensive leather gun belts that I needed a couple of additional holes put in as I have lost over 75 pounds. This thing punches through it like butter. I also liked the fact that it came with a nice little ruler to measure the holes apart, an extra punch plate and a sanding rod/awl. 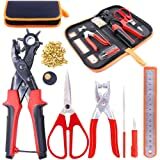 It's hard to believe someone could manufacture a quality tool set like this for the incredibly low price. The only minor complaint I could make is the instructions are not written well. I found the punch plate installed counter clockwise when shiped, but they even include a small Phillips head screw driver to turn or remove the plate. It wasn't obvious to me on how to close or lock the tool after using it. I discovered that you had to turn the punches in between individual punches to close the handle. These minor issues are not enough to take a star off due to the low cost and high performance of this tool. This thing is awesome! I love how heavy duty and durable it is. It's incredibly sharp and I appreciate that it comes with a sharpener. 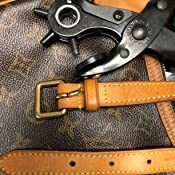 I use it to add decorative stitching to belts and other leather goods. 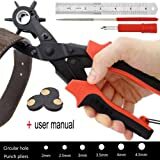 I also use it to add holes to belts to adjust the size. One of those things you didn't think you would need or want and I'm glad I can help my friends when they need to adjust their belt and have this for fun little projects. 5.0 out of 5 starsWorks well! Great for the price too. Works well and easily cuts through leather. I wish the smallest hole was smaller. 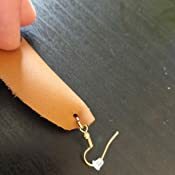 I am using this to make earrings out of pieces of leather. And the hardware for the ear wires and jump rings is smaller than the smallest hole. So it leaves a little Gap. It's not the worst I just wish it was a tiny bit smaller so you really couldn't see the hole in the leather at all. Seems pretty durable. 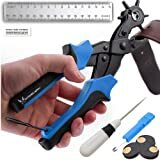 I ordered this to shorten a couple leather belts but was nervous because I don't have a lot of hand strength. NOT A PROBLEM! It is easy to operate, even for weak little me, and Everything you need is included. Two belts adjusted and back together within five minutes! Speedy delivery too! 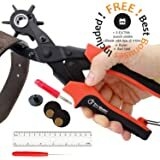 If your too long belt has a little screw fastening the buckle down and you're looking for a leather punch, get this one - it's GREAT! Heavy duty, high quality tool. It comes with a cleanout tool, philips screwdriver for replacing the striker pad, and a second striker pad. Note, you will burn through the striker pads if you use the non-brass part of the pad (black area). If you are punching fabric or other soft materials you might consider placing some cardboard on top of the pad as this will help the punch penetrate the fabric a bit easier and preserve the striker pad. I used this to tool to punch holes for snaps for a Sunbrella boat cover and it worked well through the fabric and reinforced seams. The handle is spring loaded and has a flimsy locking wire which keeps the handle closed for storage. This wire is basically useless and keeps pulling out of the handle (could have been designed much better). Apart from that minor issue, I highly recommend this quality tool. Works as it should. 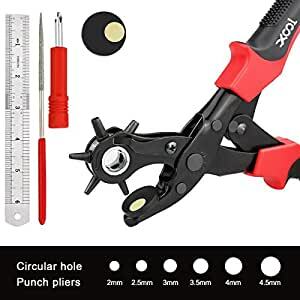 Just make certain that you use a regular screwdriver to loosen (slightly) the screw underneath the rotating wheel which allows the user to select the correct punch size. 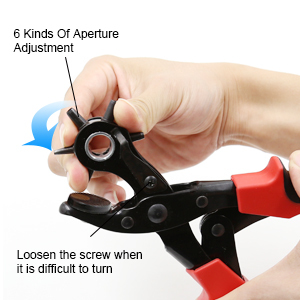 Once loosened, you can rotate the wheel freely and you don't have to loosen or tighten the screw again. Would have liked to receive the template as pictured in the photo but otherwise, happy with the product.